Monster X Tour stopped by my city of Wrocław in June. I think they meant for the event to be pretty big but with just a few days left before the show I snagged our tickets cheap via Groupon. This must have been due to lack of interest and initial high cost of the tickets. 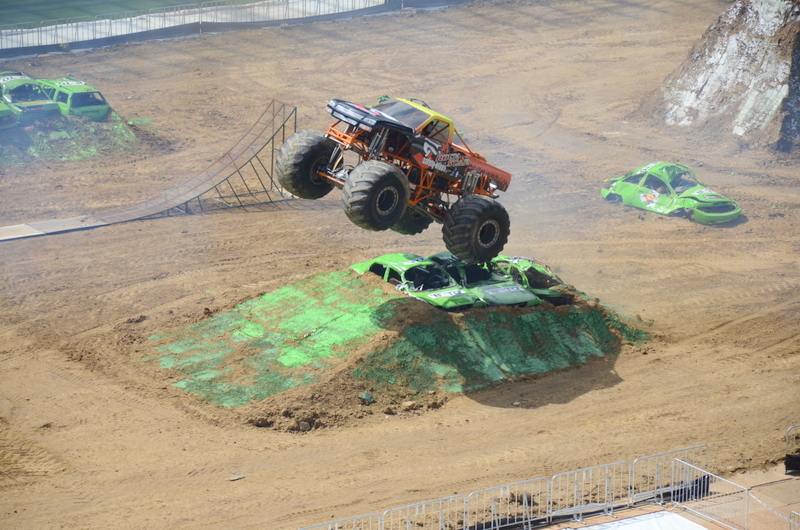 I can’t quite tell the difference between Monster X Tour and Monster Jam. 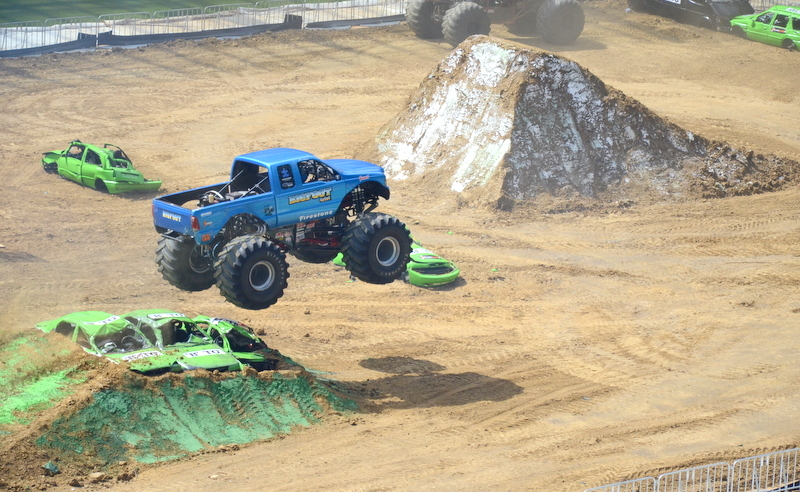 Wikipedia would have me believe that Monster X Tour is part of the Monster Jam family of monster truck events. 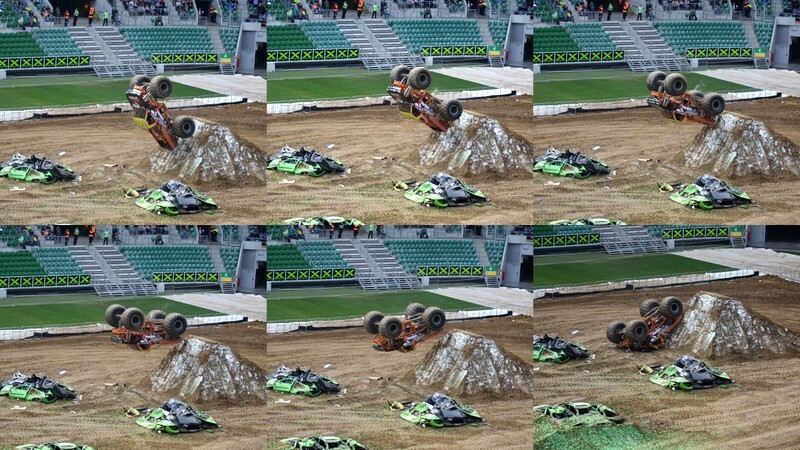 I just know that Grave Digger was nowhere to be seen and I kind of like that monster truck the most. We did see Big Foot however, the one and only, the original, the one that started it all. Of course it was some iteration of that truck, I think they’re up to version 19 now with 20 and 21 in the making, but I liked it the most for its clean and simple Ford truck look. The show was pretty loud, as a monster truck show oughta be, but that didn’t stop everyone from cheering on even louder. The show is an American invention of course but I was fairly surprised to hear most of the announcements in English only to be semi-translated a second or two later in Polish. I write “semi-translated” cause most of the jokes the American announcer made wouldn’t make much sense when translated directly so the Polish guy had his work cut out for him. In between monster truck races three guys on motocross bikes showed off some stunt moto-x riding while a team of quad riders raced around the track for a couple of minutes. While the moto-x stuff was cool to see, I totally didn’t get the quads. They just raced around in a circle and promptly left when all was done. Seemed weird. I wanted stunts on quads, too. The show ended with one of the trucks attempting a complete back flip. Now that was pretty awesome to see though the driver did fail at his attempt. Kinda curious if he ever actually pulled it off or if smashing the roof of a monster truck is just part of the show. Either way, very entertaining!